Nyungwe Forest is an acclaimed chimpanzee trekking destination, but it’s also home to East Africa’s only Canopy Walkway. This time, we took another perspective into the untouched rainforest canopy, walking upon the wildlife and centuries old treetops. And what a thrill it was! The rainforest of Nyungwe dates back to hundreds of thousands of years – it survived even the Ice Age! 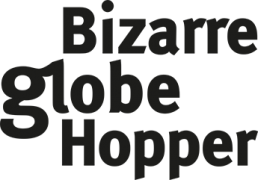 Imagine countless, jazzy butterflies flying around you, more orchid species than you’ve ever seen, and birds that aren’t seen anywhere else in the world. Then there are vicious snakes hiding in the twigs and the tension of seeing one of the 13 primates inhabiting this unique ecosystem – at least you’d probably hear monkeys shouting in a distance. Add to that the adrenaline kick of the 60 meters high canopy walkway, and well – you have the adventure to remember! 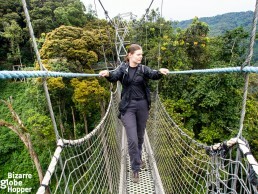 What Makes Nyungwe Forest Canopy Walk so Intimidating? The dizzying, suspended walkway hangs upon a steep, lush ravine. It’s said to be 160 meters long and 60 meters high, but the sheer numbers don’t make it terrifying. 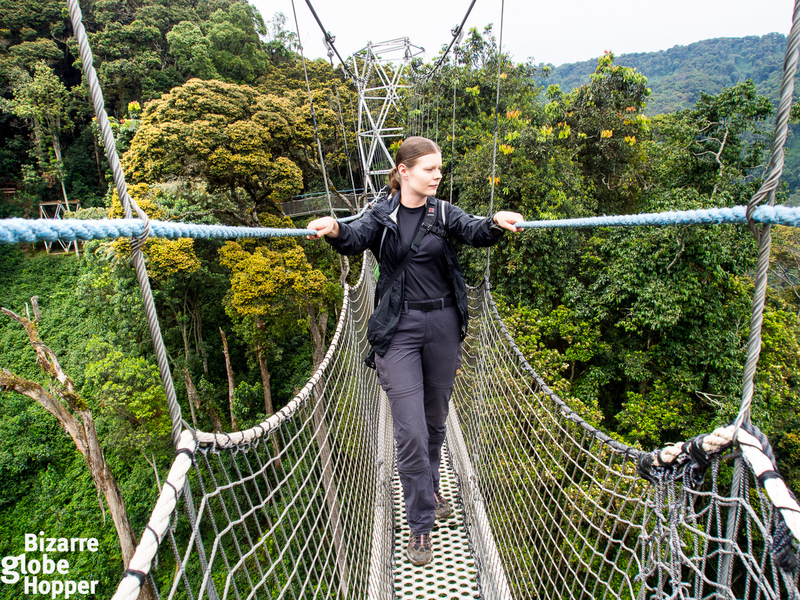 We’ve been canopy trekking in Costa Rica, and probably on higher platforms, yet this Rwandan canopy walk proved to be a true challenge for me. 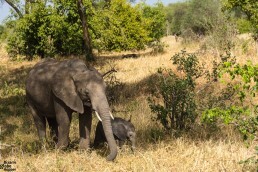 There was something magical and pure in this Rwandan canopy experience. 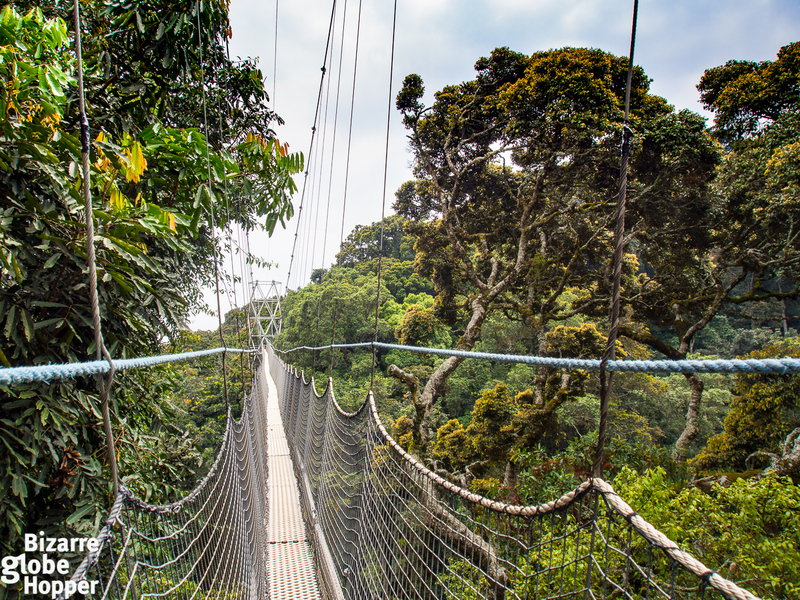 One of oldest forests in Africa sets almost a surreal frame around the modern canopy walkway. 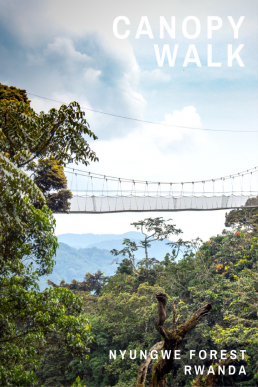 We had walked in the pristine rainforest for awhile before confronting this majestic suspension bridge all of the sudden – and there weren’t any others around. In Costa Rica, the canopies were crowded, and I could see other people safely crossing the elevated walkways, which eased my nervousness. In Nyungwe, we were the first and the only ones crossing the terrifying suspension bridge, which swayed under our feets ominously. 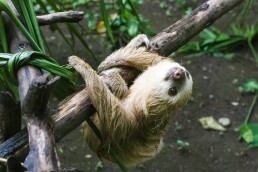 I mean, the canopy didn’t just shake, like I was used to in Costa Rica, it was swinging from side to side. It took awhile to get used to the movement and the height. 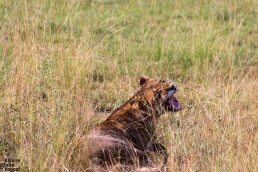 But after the initial fear, I was thrilled! 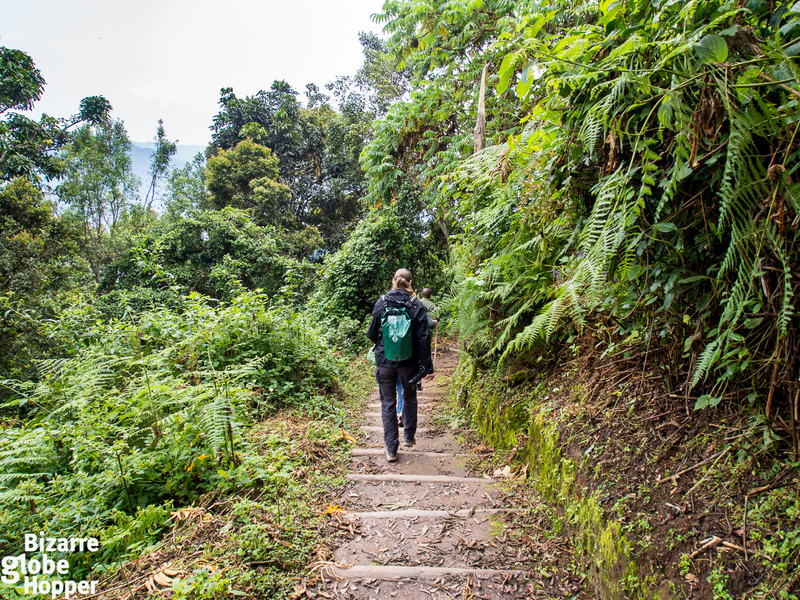 We were free to walk back and forth as many times as we pleased, spotting birds and snakes and enjoying the breathtaking views to Uwinka Ridge, the deep gorge under our feet and the lush forest canopy at our eye-level. 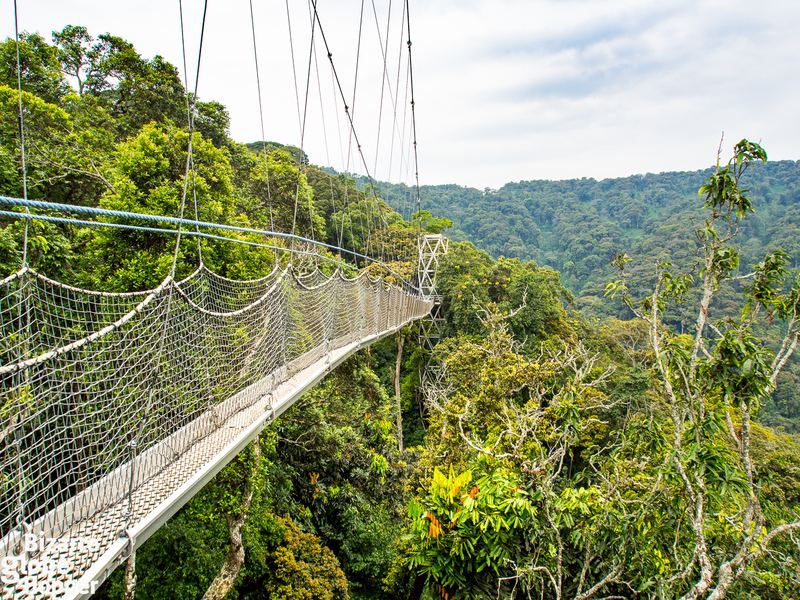 Nyungwe Canopy is the perfect place to win your fear of heights. I’m afraid of heights and bridges, but I was able to cross the canopy after a short hesitation. We were hiking with one girl, who was seriously vertiginous, still even she managed to win her fear. The canopy is short enough to make the idea of walking on it still somehow tolerable. Since we made it, you can do it as well! 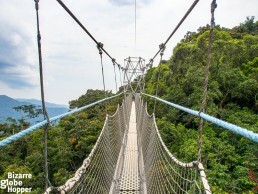 Welcome to the Nyungwe Forest Canopy Walk – would you dare to cross the walkway? 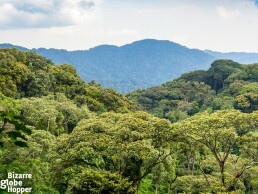 Nyungwe Forest National Park offers an authentic visit to the untouched rainforest. It’s not spoiled by mass tourism; still, the trails are in good condition. 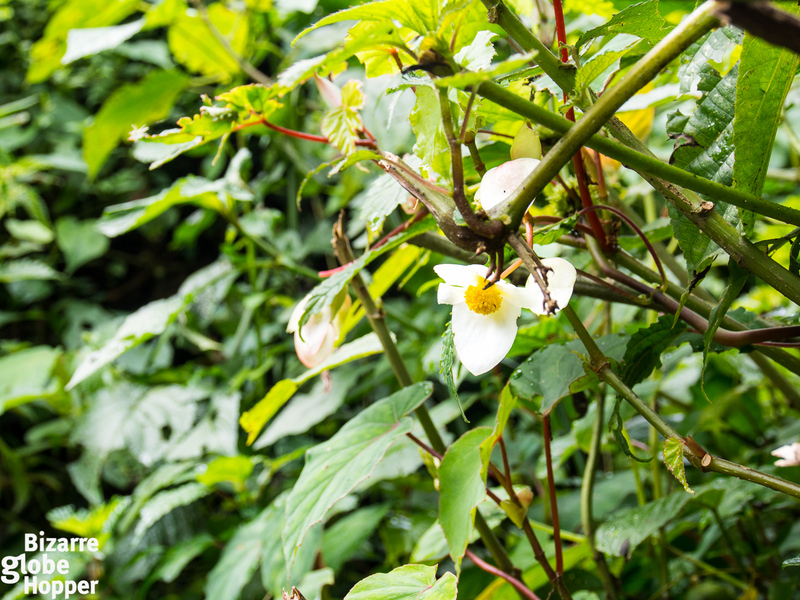 Nyungwe’s extraordinary biodiversity makes it an exciting spot for hiking; not only for primates but 310 species of bird and hundreds of orchids along with more than 1000 species of other dazzling plants. On top of 13 primates, there are more than 60 species of other mammals lurking in the canopy of Nyungwe Forest, many of them endemic to this Albertine Rift montane forest. 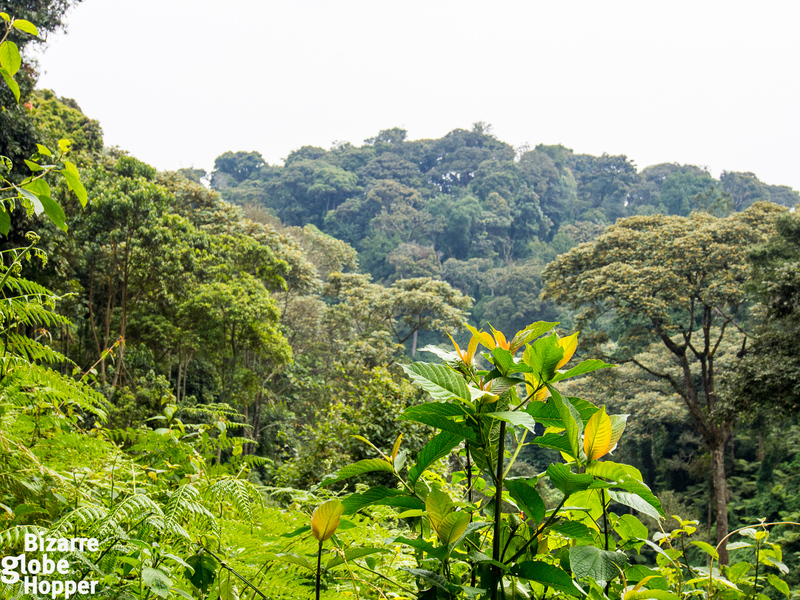 Covering approximately 2000 square kilometers, Nyugwe is largest mountain rainforest in Africa. Unfortunately, it’s also one of the last remaining mountain forest ecosystems in whole the continent. The Nyungwe canopy walk, along with the other colored trails, starts at Uwinka Visitor Center. There are no park fees, but guides are mandatory, so you have to pay a trek fee (including guide). Canopy treks are possible year-round and cost 60$. 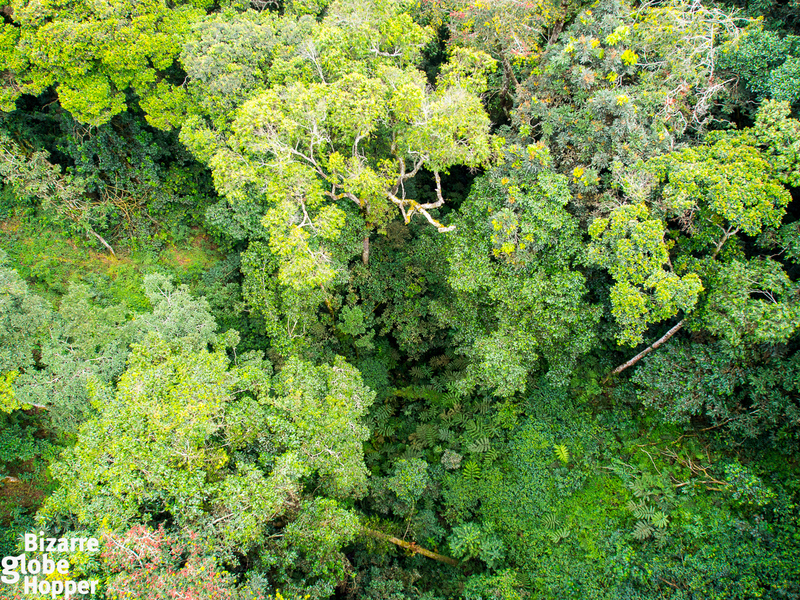 You’ll need sturdy shoes and rain gear – it’s rainforest after all. The hike isn’t demanding, though there are some steep ascents and descents. The canopy walk is accessible also as a part of hiking Igishigishigi (the official canopy trek), Imbaraga, or Umuyove trails. 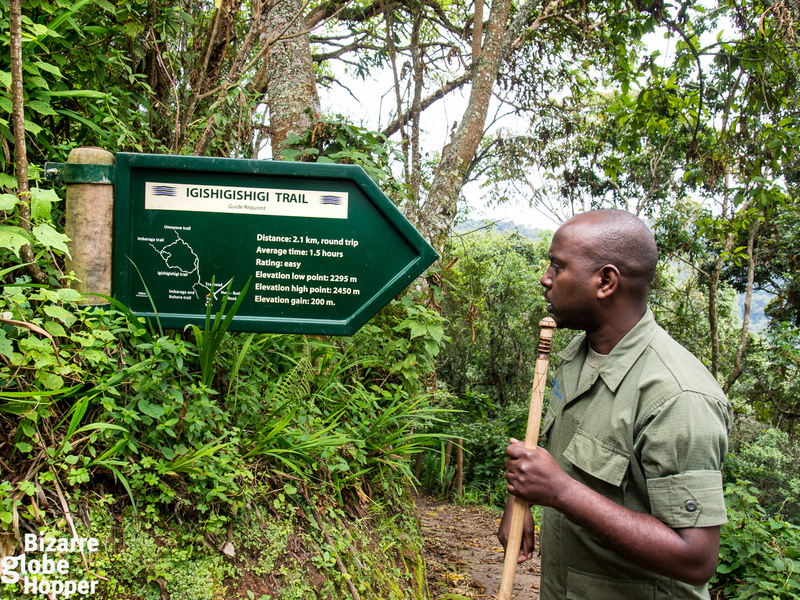 Nyungwe Forest Reserve has over 130 km of trails for all fitness levels. Some (uncolored) trails, like the popular Waterfall Trail, start at Gisakura Visitor Center. 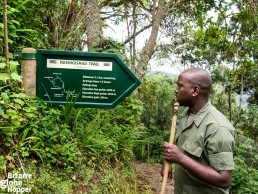 For chimpanzee trekking, Nyungwe has two habituated groups, but sightings are not guaranteed. The canopy walk proved to be a perfect small adventure on its own, and we didn’t feel the need to go chimpanzee trekking, as we had done that already in Uganda. 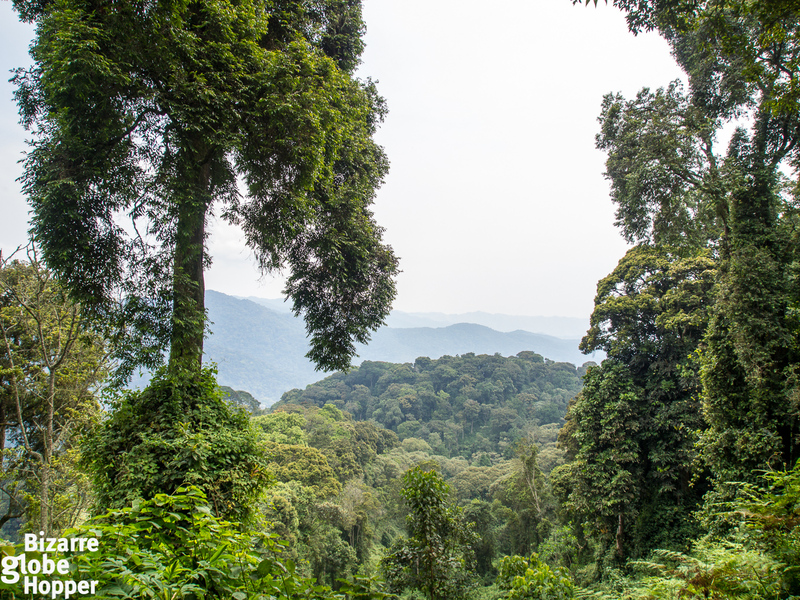 Nyungwe Forest became a national park in 2005 when Rwanda aimed to boost tourism beyond gorilla trekking in Volcanoes National Park. 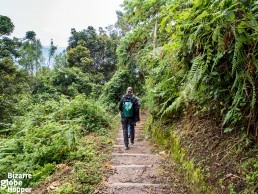 Nyungwe’s trail system was formed already in the 1980s, but the war and genocide destroyed the facilities, and most of the staff were forced to flee. Nyungwe Forest National Park lies in the southwestern corner of Rwanda. 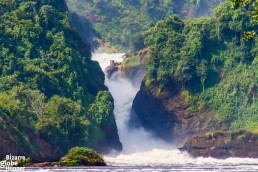 The nearest town is Cyangugu, 54 km away at the shore of the beautiful Lake Kivu. Our trip took us from Cyangugu to Kigali, through the vast Nyungwe Forest. The drive was blessed with fairy-tale sceneries and pleasant stops, like a local coffee farm. It takes about 5 hours by car from Uwinka Visitor Center to Kigali. Uwinka Visitor Center has a new interpretation center and a lookout with a beautiful view, making it an excellent place to break the journey even though you wouldn’t be taking the canopy walk or any of the Uwinka treks. Our visit to Nyungwe Forest National Park and canopy trekking tour were hosted by Lobelia Tours & Travel Agency but all opinions remain our own. 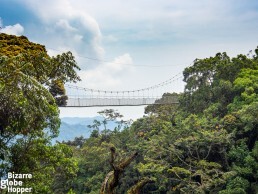 The hanging and swaying Nyungwe canopy walkway – we miss you!  Extremely grateful for such a thorough and interesting write-up. Thanks a lot.